NetZero offers a set of “home Internet” plans and a set of “mobile Internet” plans. The home Internet (NetZero DSL) gives you a fixed wireless router at home that beams signals to any local device, and their mobile Internet (NetZero 4G Mobile Broadband) is portable and will travel with you. The NetZero DSL system is a much better value for the cost-conscious web surfer, and so we highly recommend those plans for you. But if you really must have mobile Internet, you can take a look at the NetZero Mobile Internet offerings, which provide internet via 4G/3G wireless networks. 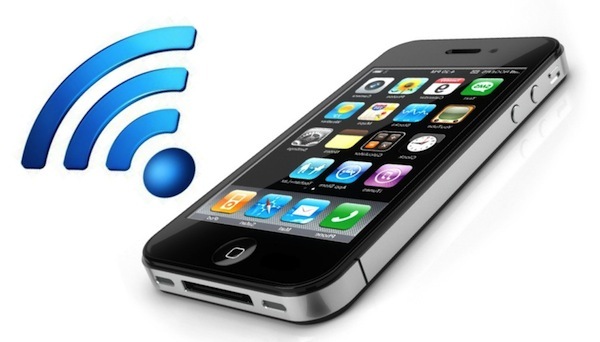 As some of their competitors have done, NetZero has embraced the “freemium” model for it’s wireless offerings. Their plans begin with a free service for very light users, and then move up in price for plans more maximum data usage. 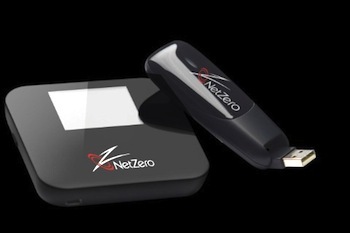 NetZero 4G Stick: This is a USB drive that you can pop into a USB port in your PC or Mac notebook computer. It will operate one device, although since it easily pops in and out you can swap it into another device if you need to. The cost is $49. NetZero 4G Hotspot: This is a small, 4.5 ounce device that outputs a WiFi signal to any device in the local area (up to 150’, but as a practical matter, maybe a the rooms of a small home). Up to 8 devices — any computer, tablet or other mobile device that can get connect through WiFi — can receive Internet at once. With either of the devices, you can be on any of the plans below. Free: This plan gives you an allowance of 200 MB of data usage per month. That’s not much, just enough to get online a few times a month. But it is free (other than the one-time cost of a device), and you might want to use it as a backup connection or just for when you travel. Cost $0. Basic: This next higher plan up will give you 500 MB of data each month. That’s still not much at all. It doesn’t seem worth it; you might as well get the free plan and use it carefully. $9.95. Plus: Doubling the data usage allowance of the Basic plan, the Plus plan also costs double the Plus plan. You get 1 GB for $19.95. And this is where the higher price of mobile really starts to show; for two dollars a month less, you can get unlimited access with NetZero’s DSL home internet system. Pro: The next plan up, the Pro, gives you 2GB of data allowance per month for $34.95. As we write this page, there are specials on the Plus, Pro and Premium that will double these plans’ maximum data usage allowances. And there is also a special that will give you half off either the 4G Stick or the 4G Hotspot if you sign up for one of these three plans. So, assuming the “limited time” specials are really not limited, you can get, for example, the Plus plan with 2 GB for $19.95 and a 4G Stick for only $24.50. NetZero DSL or NetZero Mobile? You’ve got two choices for high speed internet with NetZero (we won’t count dialup). Which is right for you? The answer is pretty simple really. If you can limit yourself to using the Internet at home, and NetZero DSL is available to you, there’s no choice: go with NetZero DSL. You’ll get unlimited internet access for a decent price. And there’s something else you should know. If you cannot get NetZero DSL, but you don’t want to pay for NetZero Mobile, you should take a look at the FreedomPop Home Internet plans. These are inexpensive ways to get broadband into the home with a wireless router that will serve more than one device. Also, FreedomPop has mobile plans that you should compare with the ones on this page. As we said at the top of this page, these mobile plans are significantly more expensive than the FreedomPop home internet plans. 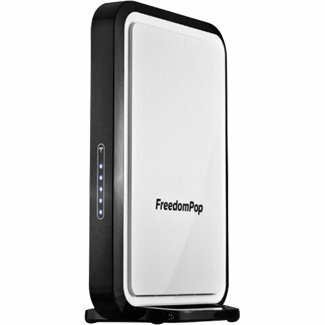 If you are going to use the internet at home go directly to the FreedomPop Home Internet page and save yourself a bunch of money. But if you must be mobile, then consider the plans on this page. If you need mobile only for infrequent occasions, the Basic (free) plan could work out well for you. Need to know if you are in the Avoca, WI area. We’re not NetZero, so we can’t answer that question, Jacqueline. I’m trying to find cheap unlimited internet for home. I have a smart tv and a coulpe of tablets.And on very low income disabled with children.And most internet services say one thing and the next thing your paying ovet a 100.00 dollars for services that half the tome they don’t work!! So clearly what do you offer straight up for home service unlimited.. The internet if just for myself, I want wifi. I would like to visit to Netzero Office in Houston TX.Where is office located-adrres,phone? Don’t! I repeat, Don’t Risk FreedomPop! I just left FreedomPop for Mobile service. Yes they have free and low cost options, but they are devious. Their business model is to catch the customer unaware and stick them with extra fees and services. The option to cancel services is hard to find – hidden in tiny print buried pages away from the sales offer. Recently they have completely removed telephone customer service unless you choose to pay for a special monthly VIP premium. Their on-line “support questions” are ignored and promptly closed (parroting the same trouble shooting steps that were already tried and failed). I really think most of their staff just lacks the company support and knowledge to help. Also, keep watch of your credit card statements; FreedomPop is known for continuing to bill even after cancellation. 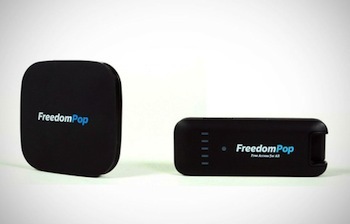 No matter how cash strapped, no matter how patient you are, just don’t get involved with FreedomPop! “We” don’t have price plans because we are not an internet service provider. 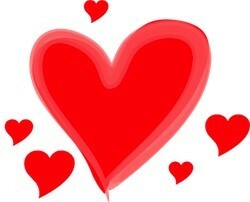 This is an independent informational website. The only way to get the answers you’re looking for is to contact your chosen service provider’s customer service team or website. We’re not NetZero, Rafael. We’re an independent informational website. We list all the plans, but plans change all the time so contact NetZero customer service to see if they currently offer any special deals.